It seems that some people have very little in the way of common sense, like this woman in the clip. 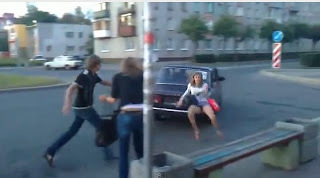 Chilling out on the bootlid of a Lada sedan in Russia with her friends, the lady is in for a shock when the driver speeds off, causing the woman to slide off the vehicle. Perhaps she will think twice before sitting on a car that is about to move off.